Living Cities was founded in 1991 with an initial focus of providing capital to and building capacity of local community development corporations. In 2007, we made an extraordinary pivot, shifting to a multidisciplinary focus on both neighborhood and system transformation. Living Cities (formerly the National Community Development Initiative) was founded in 1991 with an initial focus of providing capital to and building capacity of local community development corporations (CDCs). This support was intended to expand and accelerate the work of CDCs so that they could genuinely transform the trajectory of declining neighborhoods by expanding and accelerating the production of affordable housing. 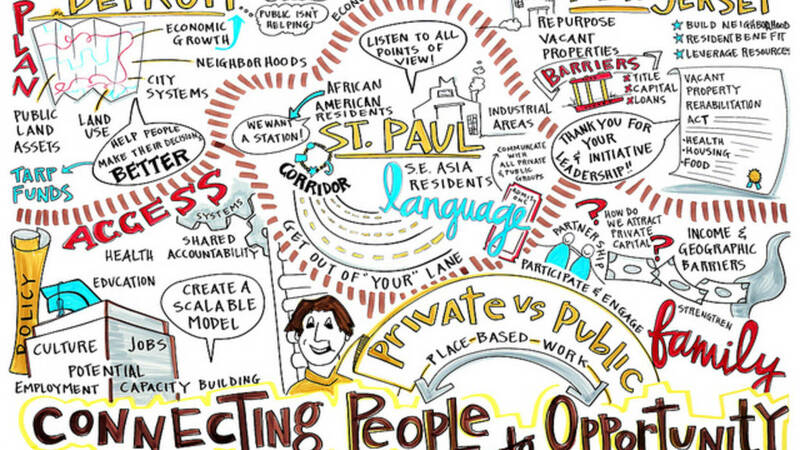 In 2007, we made an extraordinary pivot, shifting from a core focus on community development to a multidisciplinary focus on both neighborhood and system transformation. This pivot has begun to prove the full capacity of this remarkable collaborative. In 1990, Rockefeller Foundation President, President Peter C. Goldmark, reached out to a handful of other foundation CEOs to form what was then an unprecedented funding pool: tens of millions of grant and loan dollars, collected in a single initiative, to support community development across the United States. The result, unveiled in 1991 was a $62.5 million fund created by six foundations and a for-profit insurance company. The group called itself the National Community Development Initiative, or NCDI. The creation of the fund was the first action of the collaborative that would later become Living Cities. 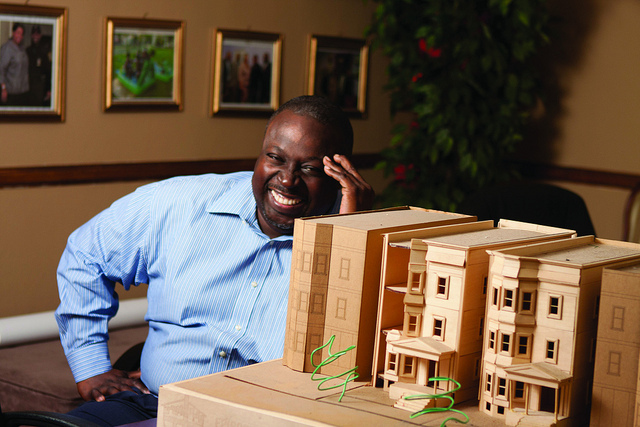 The purpose, at the start, was to inject enough capital into the work of community development corporations (CDCs) –both their projects and their core management—that they would be able to expand and accelerate production of affordable housing to a level that could genuinely transform the trajectory of declining neighborhoods. The founding members who gathered at NCDI’s first formal meeting in 1992 were the Rockefeller Foundation, the Lilly Endowment, the Pew Charitable Trusts, the John D. and Catherine T. MacArthur Foundation, the William and Flora Hewlett Foundation, the Knight Foundation, the Surdna Foundation, and Prudential Insurance Company of America. MetLife joined in 1994. For the remainder of the decade, the membership continued to expand, and with it, both the complexity of the deliberations and the scope of the work that the group chose to take on. The number of targeted cities grew from twenty to twenty three, with more neighborhoods added to the work program in most of the cities. A small number of early participants –the Lilly Endowment in 1996 and the William and Flora Hewlett Foundation in 1999—exited the partnership in the first two three-year funding rounds, but several others joined, including the Robert Wood Johnson Foundation, the McKnight Foundation, the W.K. Kellogg Foundation, Bankers Trust Co. (later Deutsche Bank), NationsBank (later Bank of America), and Chase Manhattan Bank (later JP Morgan Chase). It is significant that some of the additions to the original alliance were institutions that did not have an explicit programmatic interest in the physical redevelopment of cities. More and more, members were coming to view the collaborative structure as a way of pursuing social issues that were heavily concentrated in low-income, developing, neighborhoods. Cities, in short, were the places where many philanthropic missions intersected, and where philanthropy could fulfill its role as a catalyst of change by bringing government, private and philanthropic partners together to expand affordable rental housing across the country using the Low Income Housing Tax Credit (LIHTC) and similar Federal programs. One of the main stumbling blocks to any kind of real estate development in underinvested communities is the lack of front-end financing to support predevelopment activities such as feasibility studies, property acquisition, and project design, as well as actual project construction. During our first decade, $174 million of NCDI funding was used for real-estate projects, the vast bulk of it (91 percent) for such high-risk, up-front interim financing through lines of credit and other bridge loans, which were not readily available to CDCs at reasonable terms from other sources. By 2006, we had invested more than $540 million in twenty three cities to build or renovate more than 140,000 homes—enough to house the entire population of St. Paul, Minnesota and equivalent to the number of housing units severely damaged or destroyed by Hurricane Katrina. Our funding was deployed through two national nonprofit organizations—Local Initiatives Support Corporation (LISC) and Enterprise Community Partners—and also helped to build stores, schools, child care facilities, and healthcare and job training centers, as well as other community assets after being leveraged by a total value of $16 million—an incredible leverage value of 29:1. In 2007, we made an extraordinary pivot, shifting from a core focus on community development to a multidisciplinary focus on both neighborhood and system transformation. This pivot has begun to prove the full capacity of this remarkable collaborative. The organization now has a broader, more integrative agenda that is focused on harnessing what we have learned to build a new type of urban practice, addressing both physical and human capital issues, from affordable housing creation along transit corridors; to reimagining education, cradle to career; to youth recidivism. Together, we are working with cross-sector leaders in cities to develop and scale new approaches to dramatically improve the economic well-being of low-income people. Our investments, research, networks, and convenings catalyze fresh thinking and combine support for innovative, comprehensive, local approaches with real-time sharing of knowledge to accelerate and deepen adoption in more places. This report provides an in-depth look at the first ten years of the National Community Development Initiative: How it was founded, the work in neighborhoods across the country, and what was accomplished. This report is an evaluation of the first thirteen years of the National Community Development Initiative. 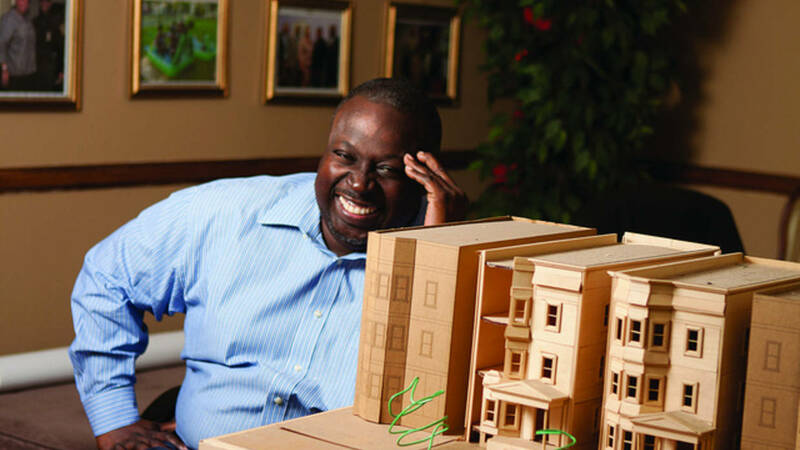 It provides lessons about transforming blighted neighborhoods through housing development. This report provides a summary of NCDI’s investments and real estate production for the 18-month period July 1, 2004 through December 31, 2005. And, it sheds light on national trends in housing development for that time period. This paper takes a close look at the evolution of Living Cities, to understand how the collaborative has stayed together so long–for over twenty years–with remarkable stability and growth in its membership, and with a core mission that has endured despite several phases of revision and reinvigoration over the years. This video shows HUD Secretary Shaun Donovan discussing the vital role of a collaborative like Living Cities in addressing urban challenges.